Viagem de ida e volta de Queenstown para Aoraki / Mt. Cozinhe no conforto de um veículo privado. Este dia de viagem é personalizado para preferências individuais enquanto você viaja ao longo de uma rota habitual. Pare para tirar fotos nos Clay Cliffs em Omarama e no Lago Pukaki, depois tenha tempo livre para explorar o Monte. Cook village e as trilhas para caminhadas além. Recolha e entrega no hotel incluída. 25th November, 2018: It was a very comfortable Mercedes for our group of eight when we started our journey from our accommodation in central Queenstown to Mt Cook. The day had clouds, a bit of rain now and then and occasional sunshine. Our guide was this great guy Abhi who worked for Legend Tours and Travels. During our journey to Mt Cook Abhi made halts in many spectacular spots, including Dunstan Lake, Cromwell, Kawarau Bridge, Lindis Pass and Lake Pukaki. Abhi gave us enough time to explore these beautiful areas; we did plenty of photo shoots and felt comfortable moving in paces to cover maximum spots. Abhi was quite knowledgeable; he shared his insights on the history and culture. Lindis pass was magnificent to say the least, you could feel the absolute loneliness of the mountains, or rather the ‘sounds of silence’ if you shut yourself from everything for a while. The turquoise colour of Lake Pukaki simply engulfed us, it was a pristine beauty...our only regret the sun didn't shine on that water while we were there! From there our breathtaking journey continued towards Mt Cook. When we reached Mt Aoraki village, a monument of Sir Edmond Hillary welcomed us. There we had coffee and some rest at Hotel Hermitage. We did pre-book the Tasman Glacier Boat tour. Abhi was very quick sorting out all the formalities for us, and on a drizzling November afternoon, we embraced that memorable boat ride to touch, feel and eat the Tasman icebergs and marvel at the Tasman Glaciers! 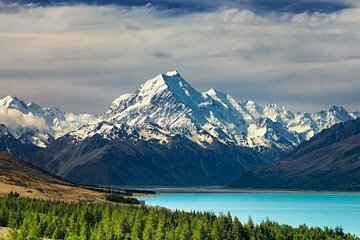 We were in Queenstown for 7 days and visited many places, but would rate this day long luxury tour to Mt Cook as one of the best ones. By no means it was tiring, our great guide Abhi looked after us quite well....would recommend anyone to embark on this tour…..